Developed by Peter Bramley any colleagues at the Royal Holloway College, London, these tomatoes contain large amounts of antioxidants - lycopene and beta-carotene. It V believed that these compounds expel the highly reactive free radical compound from cells. The free radicals have the potential for damaging the DNA and even lead to cancerous mutations. Besides, they are believed to trigger on reactions which lead to fat deposits in the arteries, thus causing heart attacks. Lycopene, which gives tomatoes their red colour, is present in twice twice normal quantity in the genetically engineered variety. Its even distribution throughout the inner parts of the Bramley tomatoes results in their musually red hue. mmunei belonging to a group Unfib which impart the bright Whim to carrots, are also prevent qmmtities in the tomatoes, wriety of other fruits and IL 5 1 - are now trying to beneficial effects of higher m(coaknoids in the diet. Says we developing technology fruit and vegetables so that they produce more." The extra lycopene and betacarotene was produced by inserting a gene (into the tomatoes) which creates phytoene synthase, a compound in plants which triggers the synthesis of many carotenoids. The researchers have begun evaluating some 30 other types of carotenoids. 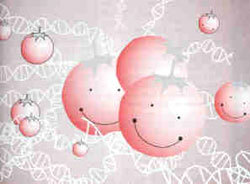 They are also studying genes or gene groups which would help in the production of carotenoids. If successful, the team would go on to engineer other fruits and vegetables, including peppers and carrots.